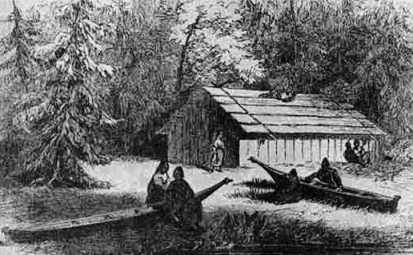 The Plank House was a typical structure used as a house style that was built by many tribes of the Pacific Northwest Coast cultural group who made them their homes. The windowless Plank Houses varied in size but were built in a rectangular shape using planks of wood from red cedar trees. Tribes who carved totem poles included these at the front of the Plank House displaying the ancestry and the social rank of the occupants. The front of the Plank House might also be painted with special animal totems and symbols.